"Similar to a wheat pita, it is bread made of whole wheat flour. I make it for my diabetic husband all the time. Serve these with your favorite fish or vegetable dish." Did not really work out at all. The dough never really became "firm and elastic", so I doubled the recipe with half all-purpose and half wheat flour. After that it turned out much better. Awesome! The trick is to roll it thinly and use a dry pan. 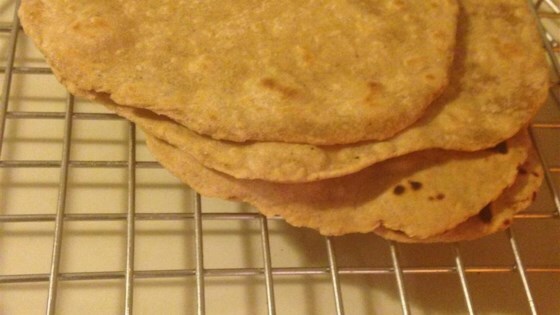 These are crisp and dry so plan to use them as a side bread not a wrap. Simple and good tasting recipe. Reminds me of home whenever I make it. Thanks for the recipe! I used SPELT flour, fried it in canola oil and ate the finished flatbread with salsa. Yum!